It’s the true hearth of the home, the place where good stories get told, delicious meals get devoured, raucous laughs gets shared, and the variety of objects from your pockets are deposited. Your dining table is more than a piece of furniture, it’s the focal point of home. And it’s the most important item of your dining room. New decor can rejuvenate a house (and its owners) and create a space where all the family will want to be. And there’s nowhere better to start than the dining room: after all, it’s where all the best memories are made. 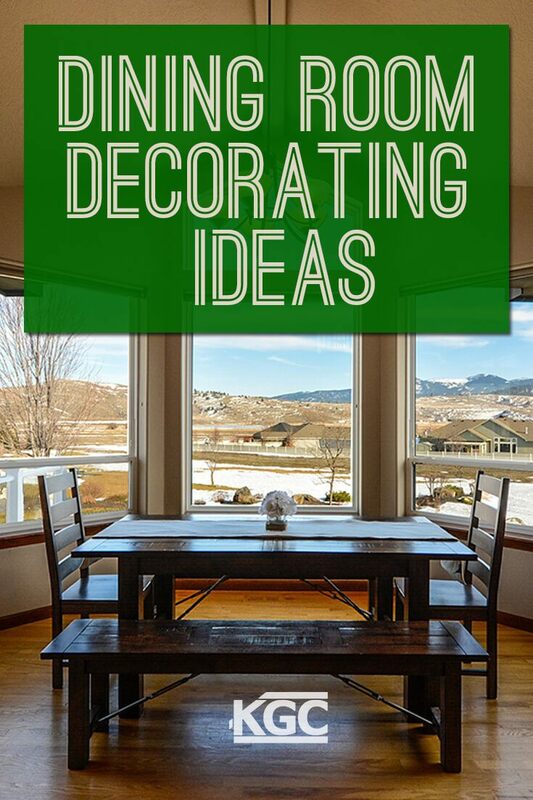 To help you decorate that space, here are some inspiring ideas and suggestions. Deciding on the color of the walls is the first step of your décor; everything else falls into place afterwards. Color the backdrop to your artwork, and your décor choice will be a lot easier once you’ve settled on the wall paint. Paint is an inexpensively way to easily transform an entire area. Many decorators favor light, cool, neutral tones for your wall paint as it gives you more options for furniture, window treatments, lighting, and accessories. If you’re feeling brave, vibrant wall colors show off personality and energy, as does a single wall of playful modern wallpaper. Another trendy option is paneling (or cheaper dupe paneling) that adds ornate trims on wooden panels for a timeless classical look. Another reason to keep your wall colors muted is to give you the option of creating unique looks with your window treatments. Simple changes here can make a space more memorable. If you like the rustic and cozy look, go for thick textured curtains; or for breezy elegance, aim for think lightly hued translucent shades that let the light in. If you can afford it, expanding your windows or adding new ones can create a stunning, welcoming area flooded with light. For most of us, when we think of decorating, we think of furniture; but without the wall color, it will be harder to choose your dining room furniture. Even one piece of furniture can transform the look of a room. Your furniture pieces need to flow together, so the style remains consistent throughout. The dining table is the centerpiece of the room, and should be chosen first, then everything else will flow from this one piece. If you have a limited budget, this is where to spend it: find one that’s durable, well made, and beautiful. There are plenty of seating options nowadays, and a bit of contrast is perfect to catch the eye and create an interesting space. Don’t match your chairs and table: love the table, then find complementary seating for it. A hint of contrast goes a long way. Think rustic benches topped with soft chunky cushions, modern transparent dining seats that blend with everything, traditional ornate English chairs to add that touch of charm; or simple chairs with a sophisticated line. Lighting is the ultimate space magic. It can make an area look dull and blunt, or romantic and inviting. Maximize the exterior natural light by keeping window treatments cool and simple, and this leaves you more versatility to create the right environment for the dining room. If you have very ornate furniture, keep the lighting minimal and unobtrusive, with simple shades and soft tones. If on the contrary your furniture lack sparkle, go for larger shades like statement chandeliers, vintage floor lamps, or statement side lamps that will dominate the space and make it interesting and luxurious-looking. Dotting lamps about the room will dazzle and bring the eye to all the corners of the room, making it look bigger. For small dining rooms, large lamps and lighting may not be ideal. A great trick here is to create a specific area by color-coding it differently from other rooms and adding a pendant light low into the space: the low lighting will make the rest of the area look larger, and the color accents will give it its own unique character. For the final decorative touch, accessories are your chance to add your own personal touch. Pictures and wall art need to be suitably sized for the space. Let them dominate an entire wall; they’ll attract the eye and bring life to the wall – and the whole area. They’re also great conversation starters, especially when they serve as the backdrop to the dining table when you’re entertaining. For the table, buy several vividly colored table runners, matched to other small elements of the room. You can easily swap these around if you get bored of them and add a new pop of color. Consider adding a think, good quality rug, which can make a space feel more welcoming and softer. Or invest in some interesting and unusual vases and plants. They can bring a freshness to a room without overcrowding them. An elegant, strategically placed mirror can open up the whole dining room area. But be careful not to place it where it might make your diners feel uncomfortable. After all, you want them looking at the room (or the food! ), not themselves. Finally, choose lighting bulbs that are soft and warm – you’ll be surprised at the effect lighting can have on the way things look. You’ll soon find yourself loving your new dining room. 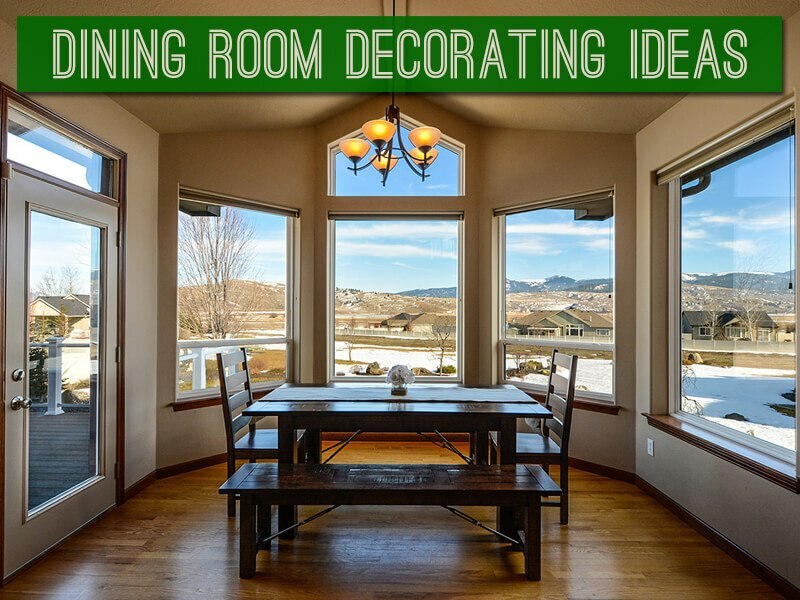 We hope these décor ideas for your dining room will help you take the first steps to redesigning this area, so you can create a room that’s truly yours and will be the source of many evenings of delightful company of family and friends. Are you ready to make lasting improvements to your home? Call KGC experts today!